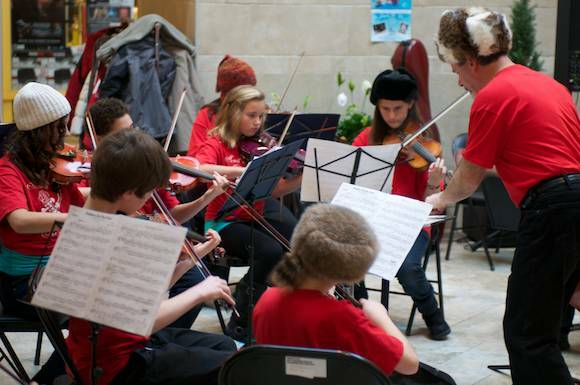 The Scroll and Bow Strings Orchestra marked the opening of Peterborough Snofest today with a musical treat. Headed by Lakefield College music teacher John Kraus, they delighted the audience with their festive music. Master of Ceremonies Catherine Hanrahan (pictured above) introduced many VIPs, including Mayor Daryl Bennett (pictured cutting the ribbon below), MPP Jeff Leal, Councillor Lesley Parnell and Snofest mascot Snofest Pete. 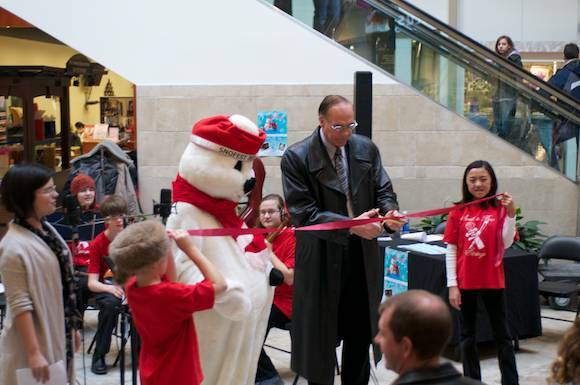 The ribbon cutting ceremony opens a week of events which can be viewed on their calendar, including Sunday's Snofest Idol at 2 p.m. at Showplace (free admission with nonperishable food donation is appreciated) and numerous food and game events throughout the week.